Keeping your kids busy during the summer can be difficult. They get bored easily, distracted from the toys and crafts you put in front of them, and need to run around to drain their energy. Taking them to the park is always a good idea, but as the temperature continues to increase, it could get too hot for your kids to spend hours in the sun. You could take them to the beach, which allows for a cool summer day, playing in the water, and building sand castles. But taking your kids to the beach can be a lot of work, a lot of preparation, and there is always the chance that once you get there they will want to go home. Summers in Kendall, Florida can get warm, the beach is a distance away, and your kids are bored of sitting inside. What if there was something that would keep them entertained, allow them to drain their energy, and keep them from getting too hot in the summer sun? There is! Jumpin’ Jamboree Play & Party Place is the place to be this summer! Your kids will have endless fun, you will be able to watch them while relaxing, and it is indoors, out of the hot sun! Besides avoiding the heat, there are many benefits and reasons to take your kids to Jumpin’ Jamboree this summer! Your kids will be begging not to leave at the end of the day. Jumpin’ Jamboree offers so many different activities, games, blow up obstacle courses, and endless jumping fun! This will keep your distracted children busy for hours while you watch them play and have fun. Let your kids go for a ride on the inflatable slides, race each other on the obstacle courses, or just jump around in our other inflatables! Have you ever tried running through inflatable obstacle courses, or jumped until your legs hurt? If not, you don’t know how exhausting it can be! By the end of your time at Jumpin’ Jamboree, your kids will be happy, tired, and ready for a great night of sleep. If you are looking for a way to keep your kids active and entertained during the summer, this is your solution. 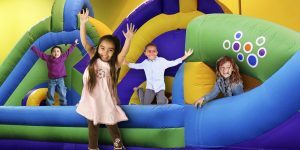 Bounce houses, ball pits, obstacle courses, and so much more will have your kiddos worn out and happy while you can finally enjoy silence. Now you don’t always want you kids spending all day indoors. But when it is the hottest point in summer, you also won’t want your kids playing in the heat all day. This is the perfect way to keep them cool, active, and playing all day long. You will enjoy spending the day inside, when the first step outside drenches you in sweat. So on the hottest of days, Jumpin’ Jamboree could be the perfect place to bring the kiddos, allowing them to run around and play without having to worry that the sun may drain them too much. Jumpin’ Jamboree wants to give your kids a fun time of play whenever you come in! No need to make a reservation or anything! Just show up with socks for your kids and they can play as long as we are open! This means your kids could play from 10am to 9pm on Fridays and Saturdays! That is a whole lot of playing! Jumpin’ Jamboree is the perfect place to take your kids for an afternoon of fun! Let them stay active, rid themselves of their endless energy, and have a blast on our inflatables! At Jumpin’ Jamboree, your kids will be able to play for as long as possible, allowing you to relax while your kids have fun. It is the perfect solution for the hottest of summer days. 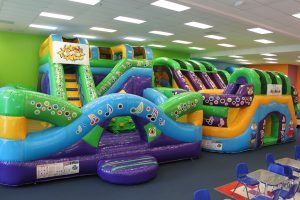 If your child is having a birthday party soon, what better place to take all their friends but Jumpin’ Jamboree? You will be able to keep your child and all their friends entertained for hours! See the information for our birthday parties now! If you have any questions about Jumpin’ Jamboree, please contact us today!